Registration is closed for Flight B as Level 9 begins. We are awaiting the official count and payouts, but the board reads 222 players. With 10 minutes left in the level, a card has been drawn and 5 more hands will be played before players will bag up for the night. 40 players currently remain, and they they will combine with survivors from Flight B tomorrow at 12pm. Fresh off hitting a Royal Flush, we join Brad St. Vincent for an orbit to see how his Day 1 is going. Blinds are 1,000/2,000 with a 300 ante. Hand 1: Brad is UTG+1 and folds after UTG opens to 6,000. Everyone folds. Hand 2: Brad is UTG and starts the hand by paying for his massage that just ended. He folds, and the hijack limps along with the button. The small blind moves all in and everyone folds. He shows the [ah]. Hand 3: Alex Rocha opens UTG to 4,500 and all fold to Brad in the big blind. He folds, asking Alex, "Is that the UTG Bluff?" as he folds. Brad offers two of his tablemates out of a prop bet for $15. Then he offers $10. The prop bet is about the number of players remaining. Hand 4: Four players limp and Brad limps in the small blind. Alex checks and the flop falls [ah][9s][9c]. One player bets 3,000 and the cutoff raises to 11,000. The original bettor calls and the turn comes [qc]. The cutoff moves all in after being checked to, and his opponent asks for a count. The all in is 51,000, and he tanks for a long time before calling. The all in player has [ac][kd]. The caller has [ad][qs] and the river comes [7c] to send the player with ace king to the rail. Hand 5: A new player is brought to the table and he folds UTG. The hijack raises to 5,000 and Alex reraises to 14,000 from the small blind. The hijack folds and Alex wins the pot. 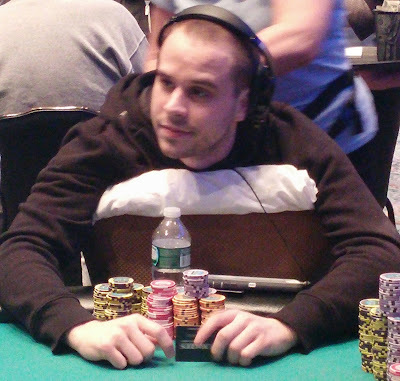 Hand 6: Brad is in the cutoff and folds. Alex limps the button and the small blind calls as well. The big blind moves all in and everyone folds. Hand 7: The player on Brad's right opens in middle position and the big blind calls. The flop falls [8s][2d][ac] and the big blind check-folds. Hand 8: The table gives the big blind a walk. Hand 9: UTG opens to 6,000 and Brad reraises to 15,800 from UTG+2. Everyone folds and Brad wins the pot. Flight B is currently playing Level 4 and is up to 153 entries so far. Players in the field include Frankie Flowers, James Campbell, Chris Tryba, Raj Patel, Chris Leong, and Mike Nye. Players in Event #4 $400 NLH Flight A are now on their last break of the day. Only 60 players remain from the 200 entrants that started the day. When players return, blinds will be 800/1,600 with a 200 ante. Meanwhile, Flight B is underway with one level already complete. So far 96 players have signed up, and registration is open until approximately 9:30pm. Cards are in the air for Flight A of Event #4 $400 NLH. Players start with 20,000 in chips and will play 15 levels today. Registration and re-entries are available until the start or level 9, or approximately 3:30pm. Players start with 20,000 in non-value tournament chips. Registration will remain open until the start of level 9 (approximately 3:30pm). Levels 1 - 12 will be 30 minutes. Levels 13+ will be 40 minutes. There is no dinner break on Day 1. Play will end after level 15 (approximately 7:45pm) or at T.D. discretion. Registration will remain open until the start of level 9 (approximately 9:30pm). Play will end after level 15 (approximately 1:45am) or at T.D. discretion.